I hate baked ziti. I hate the dried out pasta tubes around the edges, the mush in the middle, the flavorless sauce, all topped with a plastic layer of cheese, that so often grace picnics, potlucks, birthday parties, etc. I've had so many delicious pasta dishes in my life, that I was perfectly willing to never give baked ziti another try. That is until the March 2009 issue of Cook's Illustrated showed up in the mail and I read this. The good people at Cooks promised me "perfectly al dente pasta, a rich and flavorful sauce, and melted cheese in every bite," and so I was willing to give baked ziti one last try. Even though I knew I was in good hands as Cook's meticulously tests their recipes with every possible trick and tweak until they get them just right, all my past ziti experiences cast a doubtful shadow over my mind (which was somewhat lifted with the help of some good red wine). The verdict? I've spent the last two days trying to think of the next occasion that would give me a reason to make this dish again, it was that good. It was everything Cook's said it would be, and one of the better pasta dishes to ever come out of my kitchen. Sadly, it is both way too rich and unhealthy, and somewhat time consuming to prepare (about 2 1/2 hours from start to finish), to work its way into my regular meal rotation, but it definitely moves to the head of the class on the "special occasion" list. Cook's requires you to subscribe to their site in order to get the recipes (if you're ever going to subscribe to anything, you really can't go wrong with Cook's Illustrated), but a little poking around and I found that somebody had posted the recipe on Recipezaar. There's just one mistake to note, it should be 4% fat cottage cheese, not 1%. Cook's recommends Hood brand cottage cheese, and whole milk mozzarella as opposed to part-skim (and warns not to use the pre-grated stuff). And just for me, use the ziti with lines (people, it's all about texture). 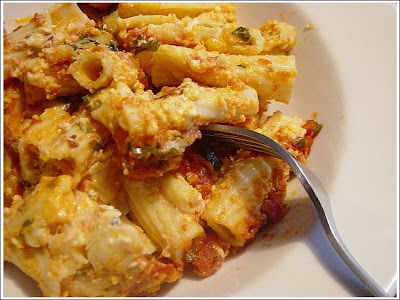 So if you love baked ziti, I imagine you'll love this reworking of the recipe, and if you're a hater like me, then this might be the one that converts you.